Marble is softer and more porous than granite, and it is higher maintenance than other types of natural stone. 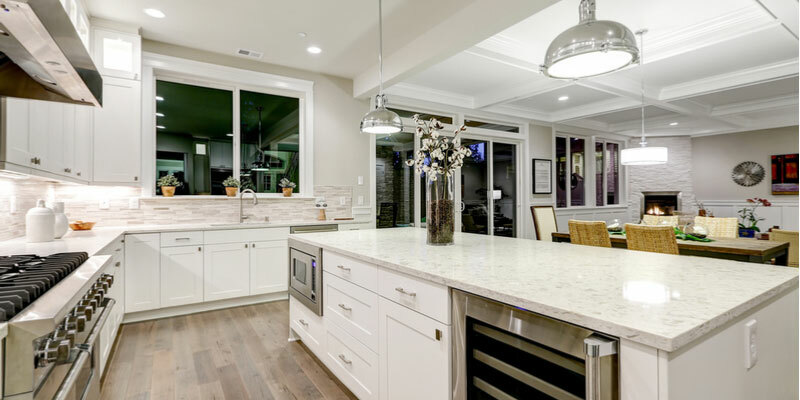 It’s not uncommon for homeowners to install marble during kitchen renovations only to realize they don’t have the energy or money to keep up with maintenance and repairs. Light colored granite can offer the same beautiful ‘wow’ factor without as much hassle and maintenance. Marble requires a lot of maintenance, largely because of its porous makeup. That means everything from oil to wine can seep through the top surface and cause stains. Surfaces should be professionally sealed upon installation to add some resistance to stains. While granite also has porous qualities, marble requires more frequent coats of sealant than granite. In fact, some experts recommend frequent cooks reseal marble countertops as often as every 6 months. Granite is difficult to scratch, but marble… not so much. Sealant helps protect against scratches, but it doesn’t take much for sealant to wear off. In fact, regular exposure to lemons or other acidic things can cause faster deterioration of sealant. As the sealant breaks down, the soft marble surface is exposed and more likely to scratch. While granite generally requires sealant as well, granite isn’t as soft as marble and therefore it’s not as easy to scratch—with or without sealant. “Honing” marble creates a matte finish that appears less polished, which makes scratches less noticeable if they do occur but it doesn’t prevent scratches from happening. Even on the hottest day of the year, marble remains cool as a cucumber—the perfect spot to rest your warm cheek. That doesn’t mean you should put a super-hot pan straight out of the oven directly on marble surfaces. Always use pot holders to prevent burning or discoloring surfaces. Of course, granite and quartz should be treated with similar respect. There are affordable options for marble, but most of the marble showcased on Pinterest is of the pricier variety. Calacatta Marble, with its bright white surfaces and dramatic veining, is one of the priciest luxury stones you can outfit your kitchen with. Carrara Marble is more affordable, it has a gray tint and softer veins. You can enjoy the biggest benefit of marble (its beautiful and fresh appearance) without the drawbacks of high maintenance countertops. How? Light colored granite! Enjoy the look of marble without the high-end maintenance and extra precautions. Granite is also porous but it does not need to be sealed as often as marble. Granite is not as soft as marble, therefore it’s less likely to scratch or show dents/marks. Your kitchen is usually packed with kids, family members or guests. You cook more than several times per week, and therefore regularly use your countertops—thus increasing frequency when marble countertops need to be resealed. You’re not the best at cleaning up spills right away—because let’s be real, you are only human. If you don’t clean up spills right away it’s very likely your beautiful marble will become tarnished by stains. You’re on a budget. Granite might not seem like the first thing that comes to mind when you think about kitchen renovations on a budget, but our top-quality granite at wholesale prices makes granite more affordable than ever before. Save money on beautiful granite countertops by buying wholesale! No one beats our quality or pricing, visit us in store to see for yourself.